How much weight will you be hauling? To determine how much weight you can haul, find out your tow rating on your vehicle and subtract how much the trailer weighs empty. Determine whether you want a gooseneck or a bumper-pull. If applicable, measure size of ATV’s, motorcycles or vehicles you may be hauling. We stock and install several accessories to tie down motorcycles, cargo, etc. Determine the length, width and height (if enclosed) you need. Determine whether you need single or tandem axles. Tandem axles will have a larger carrying capacity than a single axle trailer. Tandem axle trailers have better control when being towed. Do you want the deck over wheels or low profile with fenders. Consider what vehicle you will be using to tow the trailer. Does it have adequate towing capacity? Is your vehicle set up with the proper hitch, wiring and correct size ball? Class I- Can tow up to 2,000#. These can be installed on almost any vehicle. Class II- Can tow up to 3,500#. These can be installed on a car, van, SUV or truck. Class III- Can tow up to 8,000#. These can be installed on a van, SUV, or truck. If you buy a vehicle with a tow package, this is normally the hitch installed. Class IV and V- Can tow up to 18,000#. These are installed on light and heavy duty trucks. 4 Flat- The simplest connectors for the smallest trailers. These will control tail lights, brake lights, and turn signals. 7 Round- These connectors control tail, brake, turn and backup lights, electric brake control, and auxiliary power. When you tow, you want your trailer to be level so that your load is less likely to shift. You can change your trailers tongue weight substantially by changing the way you load the trailer. If you have too much tongue weight, your combined tow rig will sag at the coupler and your tow vehicle will have to work much harder to pull the load. If you do not have enough tongue weight, your vehicles rear tire traction can be reduced with dangerous consequences. Always strive for about 10% tongue weight and you’ll get better results. Will you need a brake control? All tandem axle trailers have brakes that must be used with a brake control. Our cargo trailers that are 7′ wide and larger have brakes. Other accessories for towing trailers. 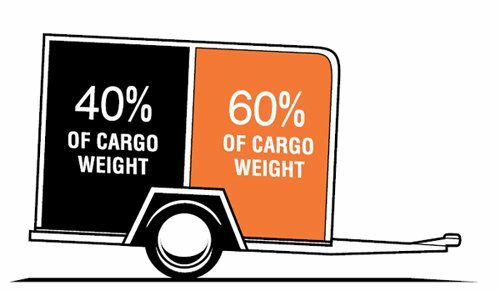 While a weight distribution system can’t increase the total amount of weight a tow vehicle can haul beyond its maximum capacity, it can improve handling by distributing some of the weight off the tongue and onto the other axles. Once set, you will not need to reset the tilt or height of the ball mount unless you make major changes in your trailer weight or your tow vehicles ride height. It is a good idea to have us adjust your weight distributing hitch for you. Sway control devices help reduce the lateral movements of the trailer and keep it in place behind your tow vehicle. A sway control is simple a “brake pad” that uses friction to resist trailer sway once it has begun and keeps the trailer and tow vehicle stable. The sway control works best when you combine it with a weight distribution hitch on a Class 3 or higher rated hitch. When shopping for trailers, compare all standard specifications, options and dealer services. We have several different makes and models of trailers. If you are looking for the cheapest trailer, you will get the cheapest built trailer.